Need to Increase ROI? You Need to See This. New year, new you, new Instabot. We've been hard at work adding features and functionality that make Instabot an essential tool for improving return on your marketing spend. Our pricing has stayed the same, but our value is so much more. Check out the 7 reasons we can help you increase ROI. Give your visitors a direct line into your calendar to book meetings entirely in the bot. Meetings are automatically booked and routed to your sales team based on any of your business rules. Get powerful booking and attribution data instantly to optimize your digital marketing strategy towards the campaigns that yield the best KPIs and results. Instead of they typical follow-ups and back and forth with forms, booking meeting directly to your sales team's calendars reduces drop-off and increases leads. Further, auto-qualification ensures quality meetings. You can now create, sync and manage your leads in your own CRM. Instabot now supports native integrations with both Salesforce and Oracle Eloqua. Set up your bots to auto-qualify leads and trigger when to send valuable conversation data straight into your CRM . Leverage chatbots and reduce time spent on marketing operations such as qualifying and categorizing leads, as well as inputting them into your CRM. Instabot can be set up to qualify your conversations before your team needs to get involved. But when clients do need to speak to someone, our live chat takeover functionality allows you to jump in. Using our alerts your team can be notified as soon as users trigger actions requiring live chat. With our new IOS app you can receive notifications that people are messaging on your website straight from your phone. 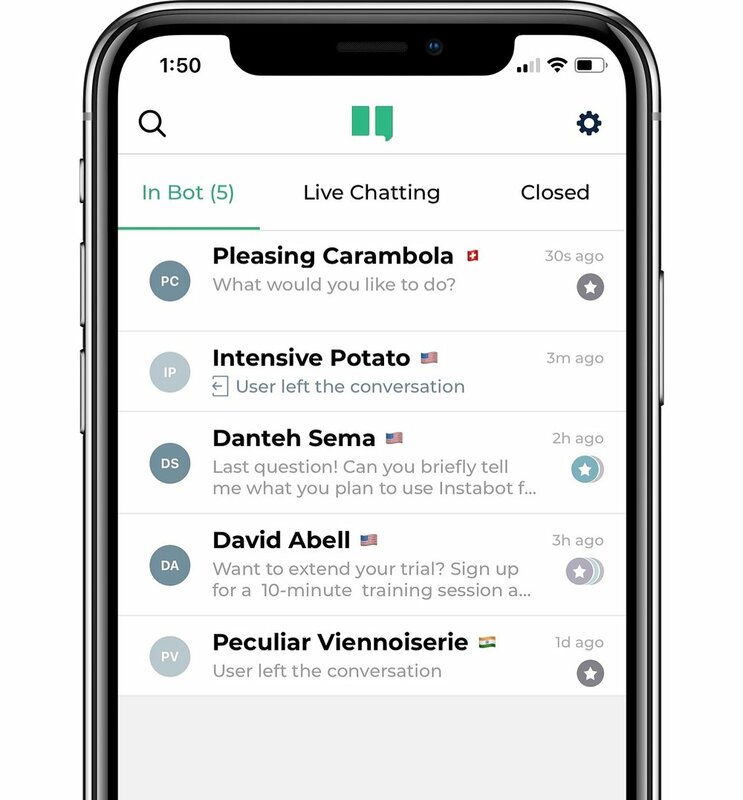 Choose to have the bot handle or live chat in real-time from in the app. 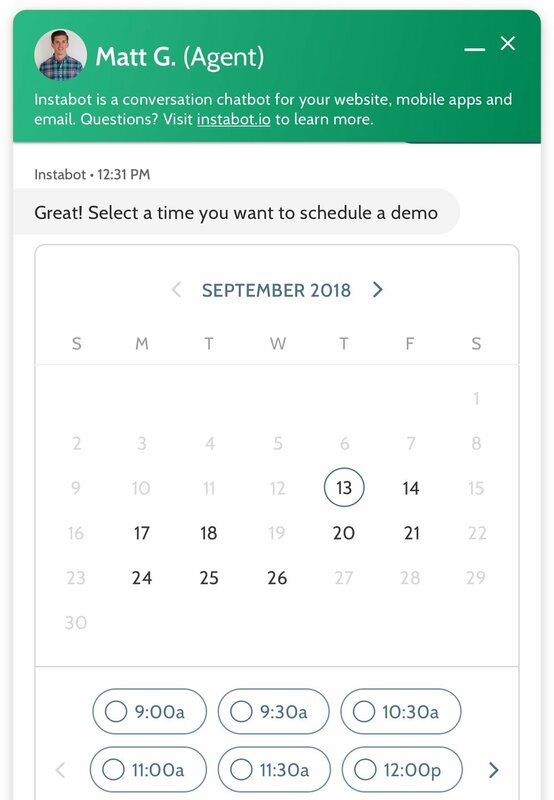 Instabot handles answering common questions, educating your prospects when you're not there and alerting you when qualified leads are on your site. Now you can get alerts and talk to prospects when you're on the go. This gives you more leads. Our agency clients are able to add value for their clients and increase revenues from accounts. New agency features make Instabot easier to roll out to all your clients so you can add more revenue for 2019. Instabot can now perform complex functions with sophisticated logic such as performing mathematical calculations, pulling information from spreadsheets, etc. This allows you to automate hundreds of tasks to your bot, reducing resources and investment on menial tasks. Easily gauge and optimize the effectiveness of your campaigns using your existing digital ads and content marketing strategy with Instabot's automatic UTM parameter capture. They are setup out of the box to capture any of your campaign tags as soon as you launch Instabot. Connect conversation data to prospects from marketing campaigns. Google Analytics can tell you the quantity of leads, but Instabot can show you the quality of leads through qualification questions. This means you spend your budget wisely on campaigns that brings the highest quantity and quality leads.